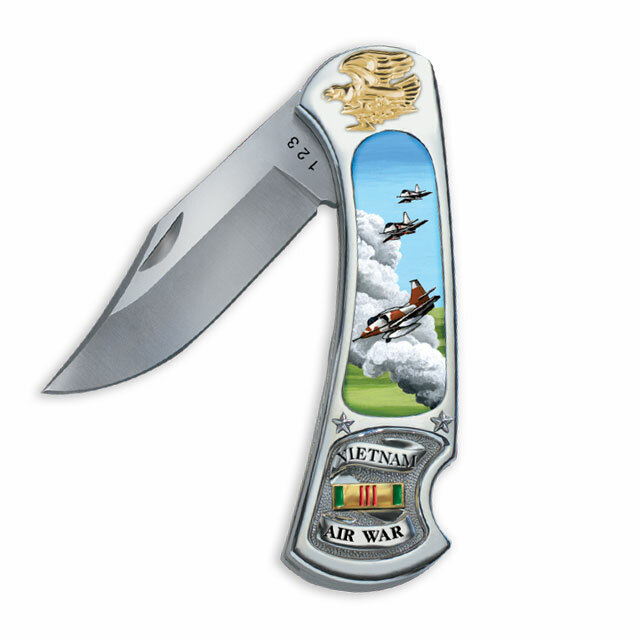 Veterans Commemoratives proudly issues three unique collector's knives, featuring the historic warplanes of the time, the A7 Corsair and the A4 Skyhawk to represent and honor those brave Americans who gave their lives in Vietnam. Original artwork captures the A7 Corsair and the A4 Skyhawk in the heat of the battle. The Vietnam Service Medal Ribbon, heavily plated with silver and gold and hand-enameled in its official colors, is flanked by the words "Vietnam Air War." A 22 kt. Gold- plated American Eagle "crowns" the top of the handle. The stainless steel blade is personalized with your name and exclusive serial number. A Certificate of Authenticity and lifetime guarantee is included. So, order yours today as a permanent tribute to our fallen heroes and to honor your service to America. Complete with padded and zippered case.